Legendary American superstar Ms Lauryn Hill over the weekend put up an awesome world class music performance in Accra during the 2014 edition of the Big Weekend Afro-Beats Festival. It was Ms Hill’s first show in West Africa and she was headline artiste for the three-day music festival put together by multi-purpose events company BBnZ Live. For over an hour and a half, Ms Hill staged an electrifying live acoustic concert that captivated her audience in frenzy as though she were a music demigoddess who had descended in Accra to entertain beyond expectation. She proved that she was a versatile artiste and treated the audience to songs from her former hip-hop group, ‘The Fugees’, performed hit songs from her personal albums as well as songs from the Reggae King, Bob Marley. It was thrilling to have a world class musician come to Ghana and perform back to back hit songs to a crowd made up of not only Ghanaians but persons who had flown in from America, Europe and some African countries just to witness the historic night. 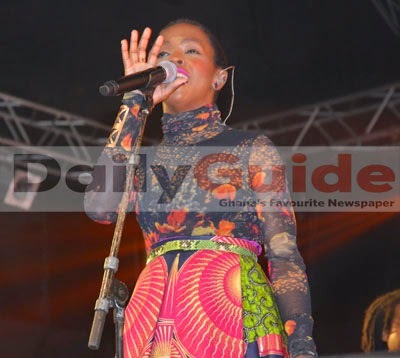 Ms Hill and her band lived up to expectations and proved she deserved the legendary status her fans have bestowed on her before they returned to the plush Movenpick Ambassador Hotel where they were lodged. A fine breed of Ghanaian musicians including Sarkodie, Stonebwoy, Wanlov, Episode, Efya, Mzvee, D-Black, Bisa K’Dee, Joey B, Koo Ntakrah, Lil Shaker and Jay-So among others were on the performance bill. Nigerian act MI also pulled a surprise at the show when he appeared on stage with XO-Senavoe to further wow the audience. Sarkodie in particular did a wonderful job when he appeared on stage around 3am after Ms Hill’s performance but succeeded in making the dispersed crowd reassemble. Many thought the show was over after Ms Hill was done and they were at the threshold of exiting the venue just when Sarkodie’s voice boomed through the microphone. As though the artiste had some magnetic force, he literally got the crowd running back to watch him and dance to his performance. The Big Weekend Afro-Beats Festival was first held in Ghana in December 2013 as a historic entertainment festival to re-brand the country as one capable of hosting world class music concerts and an enviable tourist destination in West Africa. Club Beer was beverage sponsor of the three-day concert.